Students will measure lung capacity and explore factors that affect the amount of air the lungs can hold. How much air do we breathe with each breath? Does gender, health, or athletic ability affect lung capacity? 1. Place a strip of masking tape along the side of the jug from top to bottom. 2. Use the measuring cup and funnel to fill the jug with water. Mark and label on the masking tape each 250 ml level as you fill the jug (mark at 250 ml, 500 ml, 750 ml, etc.). If necessary, add a drop or two of food coloring to the water to see the level. Set the full jug aside. 3. Add water to the tub to a depth of 5­8 cm. 4. Hold your hand over the opening of the full jug and tip it upside down in the tub. Do not let any water escape from the jug. Remove your hand from the mouth of the jug after it is underwater. Continue to hold the bottle upright so it doesn't tip over. 5. 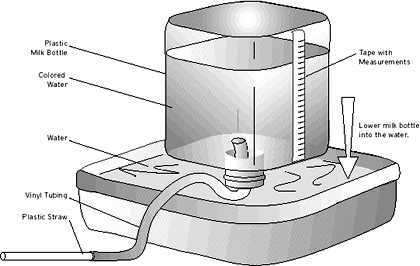 Slip one end of the vinyl tubing in the mouth of the jug with the mouth of the jug underwater so it extends about 8­10 cm into the jug. Insert a clean plastic straw into the other end of the tubing. 6. As you breathe normally, exhale once through the straw. Record how much water is displaced from the jug. This measurement is tidal air (air inhaled or exhaled during normal breathing). Watch a short movie of step 7-8. 9. Repeat steps 4­8 for each member of the group. Note: be sure each person uses their own section of vinyl tubing and a clean straw. 10. Using the measurements recorded, calculate reserve air and complemental air for each group member. 11. Construct a data table (see sample chart below) to show tidal air, reserve air, complemental air, and vital capacity for each group member. 12. Compare the group's numbers for vital capacity. Are they close in volume? What might account for differences in the numbers? 13. Does gender or athletic ability have an affect on vital capacity? Select classmates of both genders and different athletic abilities and compare their numbers. What do you conclude? Repeat the experiment with other people to further validate your conclusion. 1. Design and conduct an experiment to measure the amount of air exhaled in one breath after exercise, such as running in place. 2. Determine your breathing rate per minute during normal breathing and after exercise. Use these breathing rates and the air volumes for normal breathing and breathing after exercise (determined in extension #1) to calculate the volume of air exhaled in one minute during these activities. How much air would you inhale in one hour; in one day? The amount of air a person can hold in their lungs depends on the size of the person. A spirometer is an instrument used to measure the breathing capacity of the lungs. Various quantities of air can be determined with this instrument. The amount of air taken in (inspiration) or breathed out (expiration) during normal breathing is called tidal air. Reserve air is the air that can be forced out of the lungs after normal expiration. The amount of air that the lungs can bring in during forced inspiration is called complemental air. Vital capacity is the volume of air exhaled during forced breathing and is the sum of tidal air, reserve air, and complemental air. The lungs are never completely empty of air. After forced expiration there may still be one liter of air left in the lungs. This is called residual air. Fun fact: Your vital capacity increases as you get older until about age 25. After this age, your vital capacity decreases gradually.